The 17 ambitious Sustainable Development Goals (SDGs), which put the well-being of the global population at their center, were adopted by 194 countries in September 2015. With a specific focus on health, SDG #3 will influence the achievement of many of the other 16 SDGs, just as the progress toward these other goals will have a direct impact on health. In these early days of SDG implementation, it is crucial to set the foundation for success to achieve these goals by 2030. Five IDRC-supported regional consultations in 2016 and 2017 have explored the role of think tanks and academic institutions in the implementation and monitoring of these goals, specifically those that relate to health. The discussions were diverse, but participants converged around four priority focus areas. The most frequently raised concern across the five consultations was the need for accessible and quality data and tracking mechanisms to understand SDG successes and failures at the local, national, and regional levels. Researchers, policy research institutions, and policymakers need comprehensive data and evidence to recommend and draft policies. Equally important are mechanisms to track outcomes of policy impacts. An analysis of the SDG targets and indicators reveals that the 17 goals are interwoven and cannot be tackled in isolation. Therefore, to attain healthy lives for all, other goals that tackle the social determinants of health such as income, social environment, education, gender, and food security must also meet their targets. This is only possible when different sectors collaborate around the common goal of improving well-being for all. Critics of the Millennium Development Goals (MDGs), the predecessor of the SDGs, have argued that the decision-making process was too exclusive. Learning from the MDGs, participants at the IDRC consultations emphasized the importance of citizen engagement to address health challenges, especially those faced by the most marginalized. Citizens need a voice and the space to participate in decision-making processes to take charge of their health. We are at our most effective [as a society] when citizens’ voices are brought out and into policy debates. SDG stakeholders such as policy research institutions are important contributors to achieving the health-related SDG goals. They are capable of combining rigorous research with contextual knowledge and citizen engagement to influence policy development. 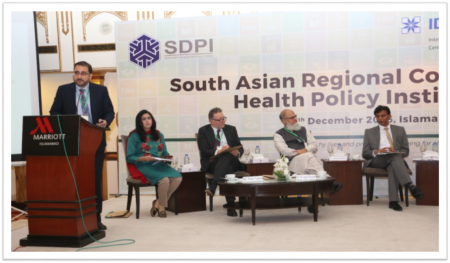 Following the consultations, and under the banner of IDRC’s new Think Health Initiative, policy research institutions are organizing regional working groups and conducting scoping studies on SDG implementation in South Asia, East Africa, Latin America, and West Africa. Through national and regional scoping studies, they are identifying the actors who are implementing the health-related goals, the integration of these goals into national development plans, and how to best track progress toward success. Together with the Graduate Institute, Geneva, IDRC is supporting THINK_SDGs, a new global network that facilitates cross-regional knowledge sharing and collaboration by connecting these and other policy research institutions with ongoing global SDG dialogues. Each of the five IDRC consultations drew at least 50 participants from ministries of health, civil society organizations, and academic and policy research institutions. Forty countries were represented over the course of the consultations.